Behind every great day is a great night at the Quality Suites North IH 35 hotel in San Antonio, TX near Wayland Baptist University. We are located off Interstate 35 near Loop 1604 near ATandT Center, San Antonio River Walk, STAR Soccer Complex, Granberry Hills Event Center, the South Texas Medical Center and more. 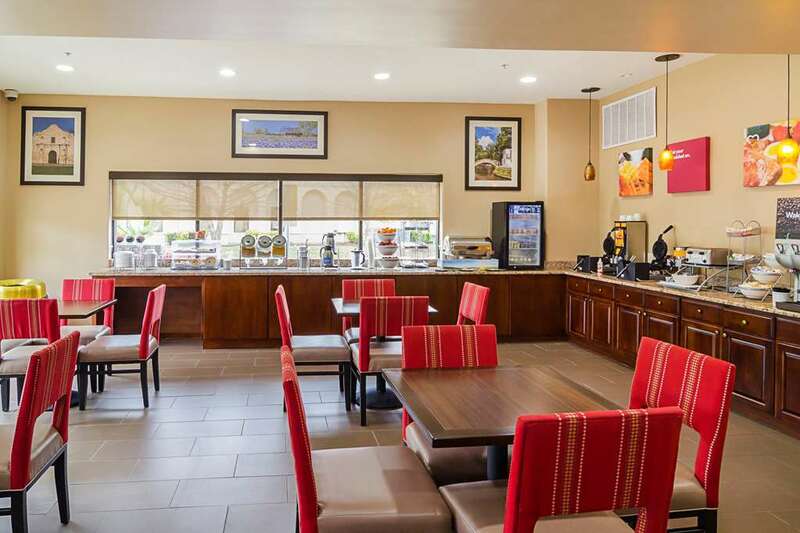 Corporate travelers and leisure travelers alike enjoy free hot breakfast, free WiFi, a fitness center, an indoor pool and a business center and meeting room. Inviting rooms include flat-screen TVs, microwaves, refrigerators, coffee makers, sofa sleepers, hair dryers, irons, ironing boards and recharge devices. Also, earn rewards including free nights and gift cards with our Choice Privileges Rewards program. All Comfort Suites are smoke free. No pets allowed. - San Antonio Children's Mus.